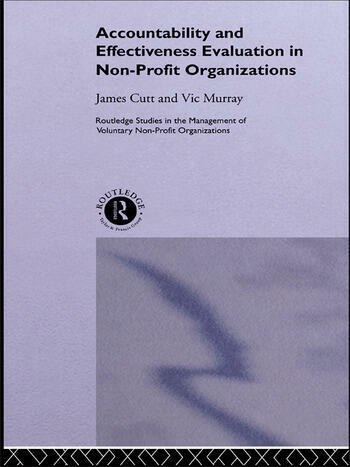 This unique volume provides new perspectives on assessing the performance of nonprofit organizations whilst meeting the information needs of decision-makers, both internal (such as resource-providers, regulators and clients), and external (including boards, managers, staff and volunteers). Whilst most discussions of accountability focus exclusively on financial accountability, this title offers a significant contribution to a relatively untouched area by combining the treatment of both evaluation and accountability from a managerial perspective. James Cutt is Professor of Public Administration and Economics at the University of Victoria, Canada. He has taught at various universities around the world and held the Foundation Chair in Administrative Studies at the Australian National University. His previous publications include Public and Non-Profit Budgeting: the evolution and application of zero-base budgeting, Comprehensive Auditing: theory and practice and Public Purse, Public Purpose: autonomy and accountability in the groves of academe. Vic Murray is Adjunct Professor in the School of Public Administration at the University of Victoria, Canada. He is active in teaching, research and consulting on the problems of effectively managing non-profit organizations of all types.